Winds around a large lagoon through a fairly open park. Huge mature trees and challenging water. Park closes at dark. No alcohol! US 131 north to Exit 88 (Ann St.), left at light on Ann, across river to a left on Monroe St. about a half mile to park on left. 1st tee across from ball field - behind bushes near the road. This course is fun and challenging (i would know, i lost 2 discs to the water). Not particularly fun to play in early spring since about 1/3 of the holes will be flooded and the baskets will be out in the water, but at least the park won't be busy like in the summer and you don't have to put up with people doing stupid stuff. Also, early spring the 2nd entrance to Riverside Park is chained shut, only entrances 1 and 4 are open and its a very long walk to find so much as a teebox or a basket from either of those parking lots since the course starts and ends at entrance 2. This is a decent course that wraps around the park and along the river. 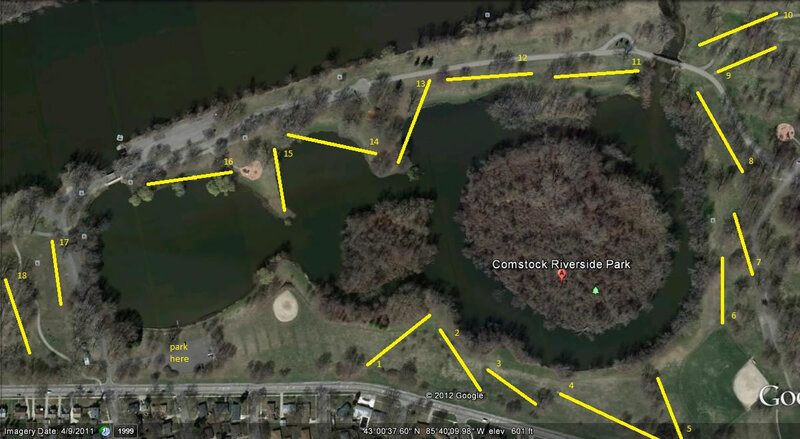 The layout is very good and does a good job keeping the disc golfers separated from those on the walking trail. Cement tee's and baskets on this 18 hole course. The course itself is very simple to throw, mostly open with some tree obstacles. The back nine does wrap around some ponds but provide minimal challenge unless you really nerf your throw. This course is built for right-handers, lefty's beware as you'll be throwing right over the water most of the time. Still a good course if you are in the Grand Rapids area to get out, get some exercise, and have a leisurely and relaxing round of golf. This course tends to be very marshy in the spring and after a heavy rain! No drinking! It's almost impossible to bring some cold ones out to this course as it is regularly patrolled by these kids playing at being wanna-be park rangers and they will confiscate your beer, what a racket, minors confiscating alcohol! They will also make you get out of the water if you throw in there and wade in to get your disc. This course is regularly plagued by idiotic park members who will MOVE picnic benches right into the middle of the fairway and then refuse to move! There are also a lot of pedestrians that linger on the shore-line so you will have to take some care in throwing, this is an extremely busy park but the course itself is usually not too busy.